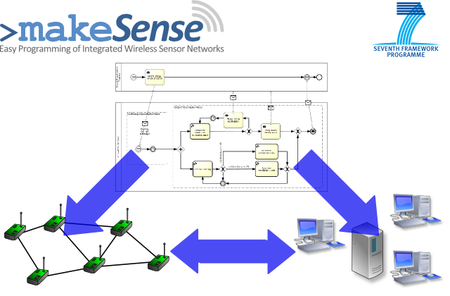 makeSense is a research project funded by the European Commission and aims to develop techniques and tools to simplify the development of business processes that involve sensing and actuation. This is achieved by extending business process modeling languages to support the seamless specification of sensing and actuation tasks, by translating these specifications into a so-called macroprogram for a whole sensor network, which is in turn translated into programs for individual sensor nodes. Our group contributes to the design of an extensible macroprogramming language which allows the specification of the desired behavior of a sensor network as a whole, including the development of an extensible compilation framework to translate macroprograms into programs for individual sensor nodes.